In 2017, an appeal in a DUI case from Fayette County State Court in Georgia, Mitchell v. State, 301 Ga. 563, 802 S.E. 2d 217 (2017), reached the Georgia Supreme Court on a DUI suspect’s appeal. In Mitchell, the State’s highest court found that the marijuana roadside test called the “convergence test” was allowed into evidence, despite the lack of scientific reliability from the scientific community. Over the defense attorney’s objection, the trial court failed to require the State to put up scientific proof (DWI-DUI lawyers call this a “proper evidentiary foundation”) for a jury being told that the Romberg field sobriety test justified Mitchell’s arrest for DUI-marijuana. Georgia law is anchored in a previous case called Harper v. State, 249 Ga. 519, 292 S.E.2d 389 (1982). Thus, for this commonly-used DUI drugs field test, this exercise cannot be cited by an officer as proof of the driver being under the influence of marijuana. Now that the Georgia high court has “called b.s.” on the phony police test, DUI defense attorneys now must cite this legal precedent to block “junk science” from being used to convict their clients. This case has far-reaching implications by bringing public focus to police manufacturing so-called “tests” and convincing motorists at the roadside to “attempt” performing them, to keep from being arrested. What Is the Romberg Test? The Romberg test is a medical screening tool named after its inventor, a 19th-century German neurologist. 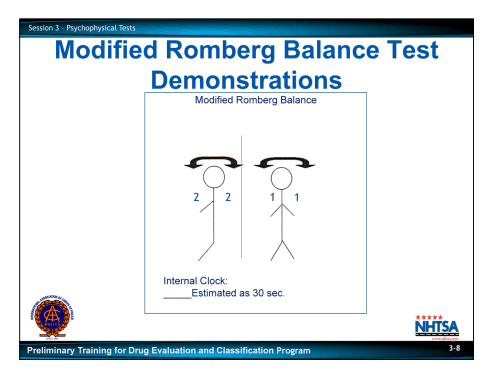 Importantly, the REAL Romberg test has nothing to do with DUI-drugs, DUI-alcohol, or any other impairing substance. In fact, when the human “balance” test was created over 200 years ago, neither cars nor drunk driving laws existed. Except for police, no medical professional uses the Romberg test to detect marijuana use. In fact, doctors only use Romberg screenings to test proprioception, which is a patient’s ability to maintain “normal” balance while standing in a specific manner. Romberg testing for anything except proprioception is bogus, counterfeit. Loss of normal proprioception is often tied to damage of the cranial nerves and the normal reflex hammers. Proprioception is the ability to use our sensory and vestibular functions (eyes, balance, and our inner ear cochlea) to know where our body is in space. Think of the brain and spinal cord as a gyroscope for the human being, and the Romberg balance test is the preliminary neurological examination that can identify (for a highly trained physician) a serious neurological disorder. 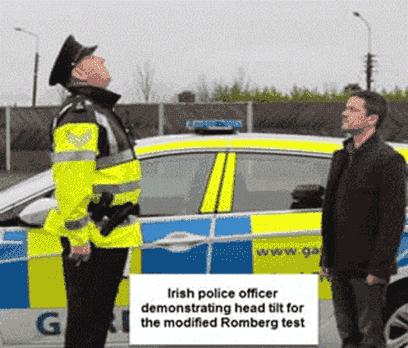 Police tests called “modified Romberg“ or the “Romberg alphabet test” are law enforcement LIES that are promulgated by federal and state government agencies. The IACP and NHTSA sponsored these bogus training courses using public funds for the purpose of getting more convictions, even if they were based on fraud and lies. In addition to the falsehood of this medical test being able to detect those who smoked marijuana before driving, some police DRE and SFST instructors have been deceived by NHTSA into incorrectly claiming that “symptoms” obtained from a Romberg neurological exam also indicates being under the influence of alcohol. The end of this farce came at the hands of criminal defense attorneys fighting for their clients. 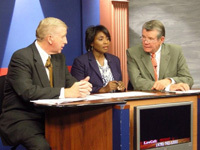 Before DUI defense lawyers obtained advanced-level training in forensic medicine through the National College for DUI Defense, NACDL and DUIDLA advanced trial tactics seminars, thousands of innocent clients pleaded guilty or were convicted of a DUI charge based on modified Romberg evidence. The modified Romberg test is NOT to judge “balance,” but is an evaluation purported to judge a person’s ability to estimate time correctly. The goal of a Romberg test for DUI-DWI has no proven, reliable connection to identifying suspects who are driving under the influence of drugs. Instead, the test screens the person’s neurological health issues, or their ability to stand or walk normally. Plus, the police-oriented exam CREATES a loss of balance. Remember that the test subject has been made to lean his or her head back at an angle rather than straight ahead, which is not the “normal” Romberg test standing posture. Then, they are told to estimate the passage of 30 seconds. Unlike a hand-held roadside breath test for alcohol, there is not a similar device for the presence of marijuana. Again, do not take this test. It only adds to the prosecutor’s pseudo-science evidence against you in your DUI drugs case. Many field “sobriety test” procedures aren’t accurate indicators of impaired driving, drug effects, and observable intoxication even though they are modified versions used by neurologists to diagnose brain disease. Field sobriety tests are the horizontal gaze nystagmus (HGN) or eye test, the walk-and-turn (WAT) or heel-to-toe, and the one-legged stand (OLT). These tests are VOLUNTARY! These unreliable exercises can only harm your chances of defeating the drunk driving charge or DUI-drug charge, especially if your case goes to trial and your poor performance is shown to a jury. 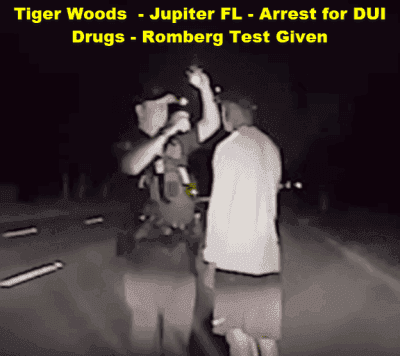 Speaking of Romberg test issues, famous golfer Tiger Woods took a very poorly conducted version of the bogus Romberg alphabet test during his Jupiter, Florida DUI arrest in May 2017. In this evaluation, the officer asks detainees to recite the alphabet. The suspect doesn’t have to recite the alphabet backward, as many believe. Rather, suspects must recite the entire alphabet or a section of the officers choosing (i.e., from “f” to “v”). Woods understood the instructions to say ‘recite the national anthem’ instead of the alphabet. Tiger passed the test once he was read the instructions again. Just like the regular Romberg, this version is a non-standard version. Read more about Tiger Woods’s DUI test here! Our three law partners have a collective 73 years of successful DUI defense to our credit. 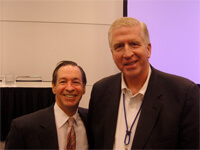 Ex-cop Cory Yager, AVVO Super Lawyer Larry Kohn, and 42-year veteran Bubba Head welcome comparisons of other law firms. When you need top-level representation from an aggressive criminal defense attorney Atlanta, you have come to the right place. We offer a FREE lawyer consultation and initial FREE legal advice. 404-567-5515. 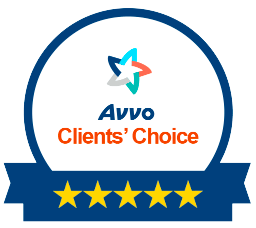 When searching for attorneys near me for your DUI defense, compare credentials, legal industry recognition and awards, and years of experience. Look out for FAKE lawyer ratings. Do not hire ANY DUI lawyer who does not know that DUI-marijuana cases have been forever changed by the Mitchell case. 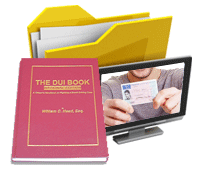 For metro Atlanta, rest assured that we have a DUI attorney near me to help fight your DUI-drugs case.